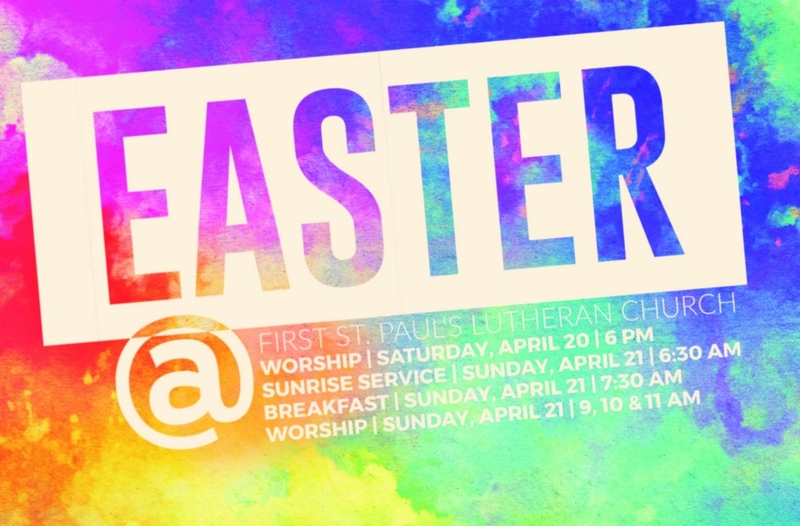 Sunday Sunrise | 6:30 a.m.
Easter Breakfast | 7:30 a.m.
Sunday | 9, 10 and 11 a.m.
We look forward to you visiting First St. Paul’s! We hope this page can answer some questions you might have as you prepare to visit. Our worship services are laid-back and comfortable. While there is no “dress-code,” people often wonder what to wear when they first visit a church. Men at First St. Paul’s wear anything from suits to jeans and polos or t-shirts. Women wear anything from dresses to jeans and dressy blouses or t-shirts. Any given Sunday, you’ll find kids and teens wearing anything from dress – up to athletic wear. It is a come as you are atmosphere! We offer two traditional services in our Sanctuary – Saturday at 6:00 p.m. and Sunday at 8:25 a.m. The liturgy and hymns are from the rich Lutheran tradition. Worship assistants and pastors wear albs (robes) and the liturgy is often sung. Music is from the hymnal and accompanied by organ. Holy Communion is celebrated on the first weekend of each month. Nursery is available for young children during the Sunday morning service. The contemporary worship service is held in the Celebration Center on Sunday at 10:35 a.m. Led by a worship team, this service includes contemporary worship music with guitars, piano and drums, responsive reading, congregational prayers and weekly Children’s messages. The worship assistants and pastors wear everyday business – casual. Holy Communion is celebrated on the third Sunday of each month during this service. Nursery is available for young children. We have plenty of parking to the west and south of the building. The main entrance to the building is under the overhang on the west side of the building. You are welcome to stop under the overhang to drop off and pick up family members. As you enter the church, proceed through the doors into the Fellowship Gathering Area. The Sanctuary is located directly up the stairs and to the left. The Celebration Center is to your right. There is a Nursery available for both Sunday morning services. A Welcome Center volunteer can direct you to bible studies and Kid’s Ministry. Need a ride? Contact the Church Office to learn about van service on Sunday morning. The hour between our Sunday morning services (9:30 – 10:30) is a time to connect at First St. Paul’s. During Connections Hour (September – May), children ages 3 – 6th grade are welcome to join us for Sunday School. There is also an adult bible study that meets during this time. Or, grab a coffee and fresh donut and join us for Holy Grounds (September – May), our weekly Parent Forum. Stop by the Welcome Center to learn more! If you’ve been visiting and would like to join First St. Paul’s, contact a pastor to learn about New Member Classes. Our Wednesday Midweek Gathering, “Ichthus,” is named after the ancient symbol for Christianity. During the school year (September to May) we invite you to join us for Neighborly Suppers, a community meal open to all. Meals begin at 5:00 p.m. Activities and programming for youth and adults, choirs, small groups and Confirmation begin at 6:00 p.m. and continue through the evening. First St. Paul’s is a church rooted in the Lutheran tradition. We are a member of Lutheran Congregations in Mission for Christ (LCMC). LCMC is not a denomination, but rather a movement of churches that views the local church as the place where people grow in faith. LCMC celebrates the local church and encourages churches to serve according to their own strengths, skills, talents and calling. LCMC is free in Christ. One size does not fit all when it comes to ministry because different communities have different needs, backgrounds and cultures. Member churches are free to be creative in their ministries. LCMC is accountable to one another. LCMC churches work to hold one another accountable. Pastors and congregations are encouraged to interact in love, respect and mutual accountability. LCMC is rooted in the Scriptures and Lutheran Confessions. LCMC churches view God’s word as the #1 authority in faith and practice and believe the Lutheran Confessions to be faithful witnesses to the truth of Scripture. LCMC is working to fulfill Christ’s Great Commission. LCMC seeks to share the Gospel of Jesus Christ, both locally and abroad. LCMC is focused on strengthening congregations and planting new churches to reach people for Jesus. To learn more about LCMC, visit LCMC.net.